Specialist in underwater exploration technology. Doctor of Technology (1985). Hero of the Russian Federation (2008), winner of the 2013 Russian government prize in science and technology. Born in Chernigov, Ukraine, on September 5, 1938. In 1965, graduated from the All-Union Extramural Energy Institute. In 1965, joined the Pyotr Shirshov Institute of Oceanology of the USSR Academy of Sciences, where he works to this day. Early in his career, Sagalevich devised a continuous seismic profiling system with an electric spark source to study seabed sedimentation mass, which was installed on all of the Institute’s major ships and made it possible to obtain important scientific results on topographies extending for more than 300,000 miles. In 1970, he began building and operating manned submersibles (MS) and was directly involved in creating Canada’s Pisces VII and Pisces XI (2,000 meters). 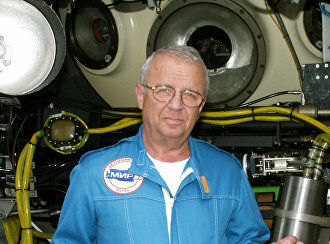 He is one of the designers of Russia’s MIR-1 and MIR-2 deep manned submersibles (6,000 meters). In 1979, Sagalevich became the head of a laboratory that supervised the operation of manned submersibles. He performed over 400 submersions as chief pilot, including two test submersions of MIR-1 (6,170 meters), and as a test pilot on MIR-2 (6,120 meters). He headed over 30 oceanic research expeditions with the use of the MIRs (1989-2007), carrying out a wide range of scientific investigations and underwater technical work. His years-long exploratory efforts resulted in a new MS-based scientific and technological method that was accepted by the Russian Academy of Sciences. Sagalevich's methodologies created a systematic basis for oceanic exploration, while the submersible craft acquired the status of a unique scientific tool enabling deep-water observations with the use of the most advanced scientific and navigation equipment. He supervised the development of unique deep-water technologies that make it possible to seal off sunken radioactive facilities. He led eight expeditions to the sunken nuclear-powered submarine Komsomolets, one expedition to the nuclear-powered submarine Kursk and a unique submersion under the North Pole-2007 program, for which he was awarded the title of Hero of the Russian Federation. Sagalevich is a member of the US Academy of Underwater Arts and Sciences (2002). He is the only Russian scientist whose name is enshrined in the Hall of Underwater Fame in Miami. He is the author of more than 300 scientific works, including three monographs, and has co-authored 10 books. He was decorated with the Order of Lenin, the Order of the Badge of Honor, the Order of the Polar Star (Mongolia), the Order of Courage, and the Lowell Thomas Medal Award of the US Explorers Club. He was named Explorer of the Year of the US Adventurers Club for his historic submersion to 4,300 meters at the North Pole (2007), and has received a Lifetime Achievement Award from the US Adventurers Club.